Decisive in the struggle against state repression by criminalisation of popular movements, beating demonstrators and putting them in prison or by other means is political mobilisation. Historically the left have been an important force in this anti-repression work together with solidarity between all kinds of popular movements whether defined as left or primarily by other categories as Christian or other faith groups, the environmental movement, radical pacifists or the feminist movement.. Also liberal and conservative forces defending the rights of the individual have sometimes played an important role. All these anti-repression forces were strongly present at the protests at the Climate Summit in Copenhagen in December 2009. The issue as such have provided a basis for broad alliances often on a system critical platform. Especially privileged were three left wing and one social liberal party as key note speakers and among the organisers of a mass rally with 100 000 participants on December 12. The parties have strong organizational resources, a member base and easy access to media. Almost one thousand of the demonstrators got arrested and put in a special prison and a thousand more during the time of the UN conference. There was a great need and possibility for defending the freedom of assembly and speech in Copenhagen. The historically interesting during the protests at the Climate Summit in Copenhagen in December 2009 is that the formally organized left was the first political actor that aggressively supported a police perspective on attacks against the main demonstration. They also refused to support any collective response to the repression. Instead the left wing parties used the occasion to gradually differ in their position towards the demonstrators, the police, the laws and the right wing government to compete with each other on harmless policy differences and avoiding doing politics to challenge in common power relations that curtails freedom. 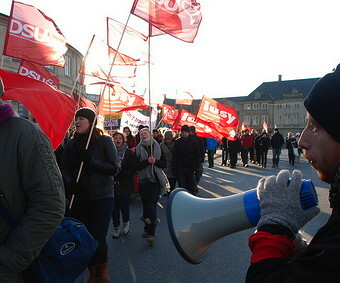 In terms of members the formal left wing organisations and their sympathizers extremely outnumber those supporting left wing forces in the Climate Justice Action in Denmark. The two biggest besides trade unions are the social democrats with 50 000 members and the Socialist People’s party with 17 000 members. The third left-wing parliamentary party is Red Green Alliance with 2 000 members. Their position one could claim was such that they all could have used the occasion for strengthening their role as political opposition in Denmark supporting freedom of expression. They to a large extend did the opposite. How they did this can be described day by day.